Fallen! Fallen! Still fallen am I who else accept Sri Gaur – Hari’s Mercy – embodiment Sri Nityananda’s other – self Sri Gurudev His Divine Grace Srimad Bhakti Vilas Tirtha Goswami Maharaj who out of his bounteous mercy, looked with merciful eyes at me – the vilest creature. While, one day I was seated in front of the Icon of our Vishunpad Sri Srimad Bhakti Siddhanta Saraswati Goswami Thakur, the illustrious Founder – President of Sri Chaitanya Math and Sri Gaudiya Maths – who is the mainstay of spiritual guide of millions of souls, a light flashed in my mind that I should look to Srimad Bhagavat Gita. The food that nourished me was his grace. Neither any good quality nor any literacy have I. The acting will that undertook this writing is not the person in personal pronoun to put his name here. It is like the Ganges water which flows from the lotus Feet of the Lord and offered again to him alone; so too let it be offered at the lotus palms of my Divine Master. Prof B. R. Baliga, Retd. English Professor of Madras Presidency College who is a recipient of the Grace of my Divine Master is always a lucky person to put his able service in looking after the correction of the language as well as going after the press printings. By the grace of the Supreme Lord, this book has been will received. Some of the universities of India as well as many Institutions of U.S.A. recognized it as a consulting and reference book for thesis work. Hundreds of appreciative letters come from the Indian Philosophers as well as from abroad. One appreciation letter is reproduced here: “The author evidently made a careful study of most of the important teachings of Visvanath Chakravorty and Bladeva Vidyabhusana who have interpreted the Gita from a Chaitanyaite’s point of view. It would be well if the ideas contained in the book could e widely circulated and read. So much of the present unrest and trouble in the world is due to avoidance of godliness and spiritual things and worrying over things that do not matter. The book will be liked by those who believe that Bhakti or devotion to Lord Krishna is the sole remedy for the ills of mundane life.” – Dr. Sudhindra Chandra Chakraborty, M.A.,D. Litt, Darshanacharya, Bhagavataratna, Reader in Philosophy, Visvabharati University Santiniketan and also the author of Philosophical Foundation of Bengal Vaishnavism. Now this 2nd edition is brought out with some revision of the original. Prof. R.N. Sampath, of Presidency College of Madras has been kind rough in looking after the corrections as well as going after the press printings. And ‘Sri Gopi’ happily gave the design of the cover, Sri T.S. Narasimhan, Advocate; of the liberty press also took keen interest in bringing out the book. All of them are naturally be rewarded for their service by the Lord Himself. No doubt long before the second edition of the book exthusted and there was a great demand form the devotees, but due to other commitments we could not bring out the third edition. Now while we are bringing this third edition we made a through revision particularly from the chapter IX to XII. Due to my suffering from the disease of Parkinson I was not able to write in my own hands. Here Sri Shambhu Nath Dasadhikari staying at Sridham Mayapur helped me to take dictation. Sri B.S. Sannyasi Maharaj composed entire matter of this edition from our Math computer and Sri Madhu Sudan Sharma (M.A) who went through the proofs. For their such work they will be rewarded with blessings of the Vaishnavas. The Gita is always designated as Srimad Bhagavat Gita i.e., it is a song concerned with God and godliness. It sets forth a way of life and a view of the reality. It is a song sung by God Himself to His beloved devotee Sri Arjuna. It has also got a special beauty of its own which a famous verse describes as – Arjuna, like a calf sucking the under of the Upanishad – cows, the nectar – like milk being poured into the milk – pali, the Gita. It is rightly said that” All the Upanishads are the cows, Sri Krishan is the Milker, Partha (Arjuna) is the calf, men of purified intellect are drinkers of the ambrosial milk of Gita.” This priceless spiritural treasure has held its sway undiminished from time immemorial, and it is one of the triple – source – books (Prasthana – traya) – considered as undisputed authorities of the living religion of the Sanatanists. Its influence on the minds of people is second to none. So vivid is its presentation of he promptings of the human heart, so comprehensive the scope of its speculations, so catholic and tolerant its views, so deep its fervour of devotion, so convincing its appeal for the development of a spiritual out – look, so appealing its intermingling of abstraction and devotion, so happy its reconciliation of divergent views, so universal its message of deliverance, so practical its teachings that it is neither old nor new, and it is an eternal version of the perennial spiritual treasure of the people for all times. According the Sanatanist belief, this book of divine sayings is beyond the limitation of time and has come to us from time immemorial. There is not a single book among the Sanatana scriptures which has had so many commentaries written by all and sundry religious sects, which invariably accept it as very authoritative, placing it almost on the same footing as the Vedanta and the Upanishadas. It is more popular than any other religious literature in India. The main cause of its extremely wide popularity is that is contains all the principal religious thoughts. The Gita has for ever rejuvenated mankind by the divinity of its religiosity. 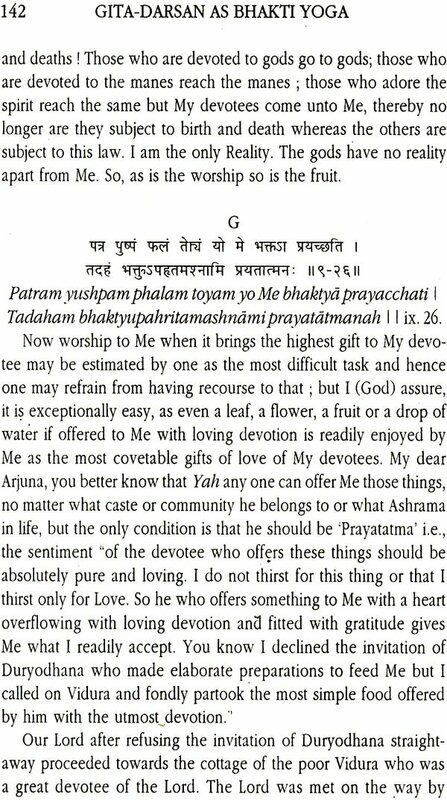 The thirst is unquenchable to the thirsty; and the Gita with renewed vigour rouses the divine thirst in us and still when it quenches it still excites the undying thirst. In God’s documents the epochs that have passed are insignificant chapters in our progress. We may travel onward still, and still the star of the Gita can beacon us not merely to marvel at the destiny of man, but to pervade the inner spirit of man from whence awakes the history of perennial time. Such is the genius of the sacred book. Dr. Radhakrishnan says: “It represents not any sect of Hinduism but Hinduism as a whole, not merely Hinduism but religion as such, in its universality, without limit or space.” – The Bhagavat Gita P. 12. “The Bhagavat Gita is a profoundly simple scripture, so rich, so synthetic, and so vital which the Master sang 5,000 years ago – centuries have saluted Him as Bhagvan – Krishna, the singer of love divine! – T. L. Vaswani. Dr. M. A. Kamath in ‘Essentials of the Bhagavat Gita says: “The Gita is not a theoretical treatise but a practical guide for every man in every doubtful and difficult situation.” P.71. “The Gita is a performance of great originality, of a sublimity of conception, reasoning and dictum almost unequalled “ Warren Hastings, First Governor – General of India.